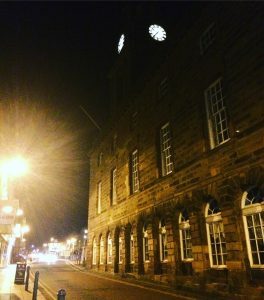 The official start to the Berwick Literary Festival 2017 was in the Guildhall, on Friday 20 October at 7pm. The chandeliers were sparkling; velvet curtains draping and a big crowd was gathering. Michael Wright, chair of the festival’s steering group and the town mayor, Gregah Roughed, made their formal welcomes and introductions… and then legendary Ian McMillan, poet, raconteur and broadcaster began his 45-minute break neck speed ride of laughs. Formalities were dispelled with and the grand room shook with laughter. Laugh a minute? Laugh a second! He took the whole audience with him and I could hardly get my blogger’s notes written, for laughing and crying. 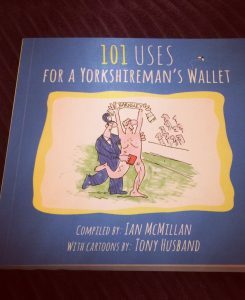 His side-kick, the famous Private Eye cartoonist Tony Husband, sat in the wings – while Ian, who currently presents BBC Radio Three’s The Verb, recounted tale after tale of his gigs around the country in halls and schools. Ian used the word gig to keep his spirits up he said; me too, it gives my blogging gig in Berwick a feel of being at the centre of a cultural vortex; I like that. His Barnsley accent added to his observations and reflections, grounding it all in real life. For me he’s like other great comedians such as Victoria Wood and Billy Connolly – they relate true happenings, which happen to be very, very funny. 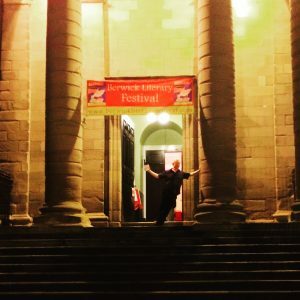 As Ian said, “I wish I was making this up!” Whereas most of the other events in the festival gave me some backstory to the contributor, this was purely top-notch entertainment… for a tenner! I love word play and Ian obviously does too… it’s how he lives his life; how he makes his living; how he looks at the world. From incorrect introductions to signs in shops to teachers’ traits Ian played with words. Now and again his poetry popped up its head. A punter the next day said, he hated poetry at school and that he would rather have had double maths, but that Ian’s poetry was engaging and entertaining. He probably spoke for a lot of people on Friday night. And I learnt a new word… isogloss. Isogloss is the line on a map dividing areas and their dialects. If you love words you tend to love accents and dialect – I do. Ian’s tale about someone getting new double glazing for their arse, proved the comedic value of a different pronunciation of a word – of the word house. Funny. And just when I thought the evening was nearly over, Tony joined in at a flipchart, sketching the Guildhall and I remembered the event was billed as A Cartoon History of Here. There were more delights in store. As a chorus we contributed ideas and sang along with Ian, as he and Tony created an illustrated ballad about Berwick. It took flight and soon we were singing about seagulls and perches and grieving and dying – but it was still funny. Cartoonery, comedy, poetry and improv came together and the mean film star of Berwick, Steven Seagull, was born. I’m still chuckling about it… two days later. 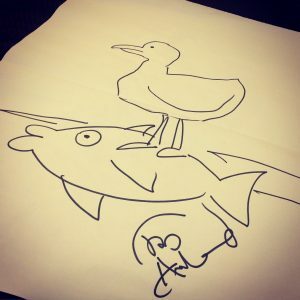 And I have the proof, as at the end of the evening Tony’s on-the-spot cartoons illustrating it all, were up for grabs and I nabbed the one below… Steven Seagull on his Perch. We even had Pamela Wright, from the steering group, using a paper origami seagull to add some pathos to the elegy at the end. Ok, it was a scrunched-up piece of flip chart paper, but Pamela was fully on board. There were some of Tony’s and Ian’s books on sale too; I couldn’t resist. But mostly this event was a clever and creative take on words and on Berwick; a fitting way to kick start the 2017 Berwick Literary Festival. And as it was ending, one last quip… Ian strode to those plush velvet curtains, drew one to the side, looked out and said, “All your cars have been pinched from the car park!” Guess you had to be there. As I set off back to the guest house, The Anchorage on Woolmarket, I got talking to a young couple leaving the gig… they had recently moved to Berwick from down south. They agreed with me… fantastic entertainment and welcoming local people. Hey, we could’ve been anywhere in the world at that moment… Newcastle, London, Paris. But here we were in a vortex of cultural happenings, inside the walled town of Berwick. 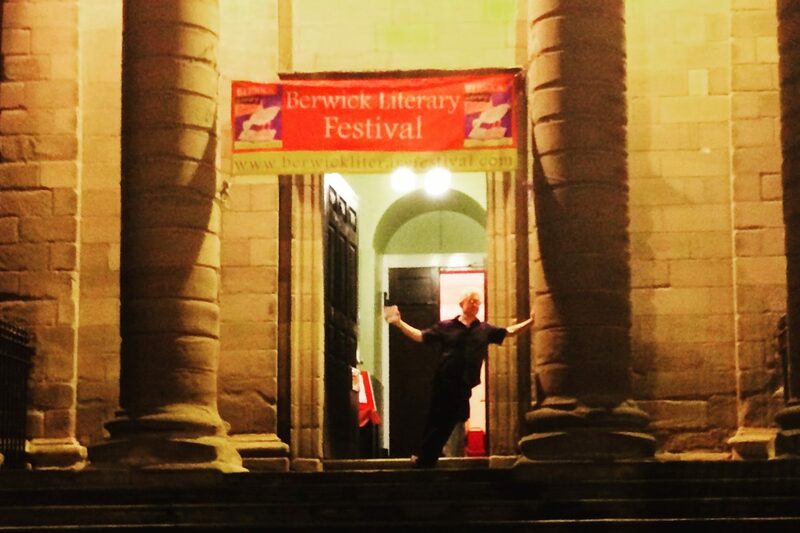 Thank you to: Ian, Tony and the Berwick Literary Festival Steering Group and Organisers for a great night, and I wish Andrea and Kevin, that young couple, the best of times in their new home- town.